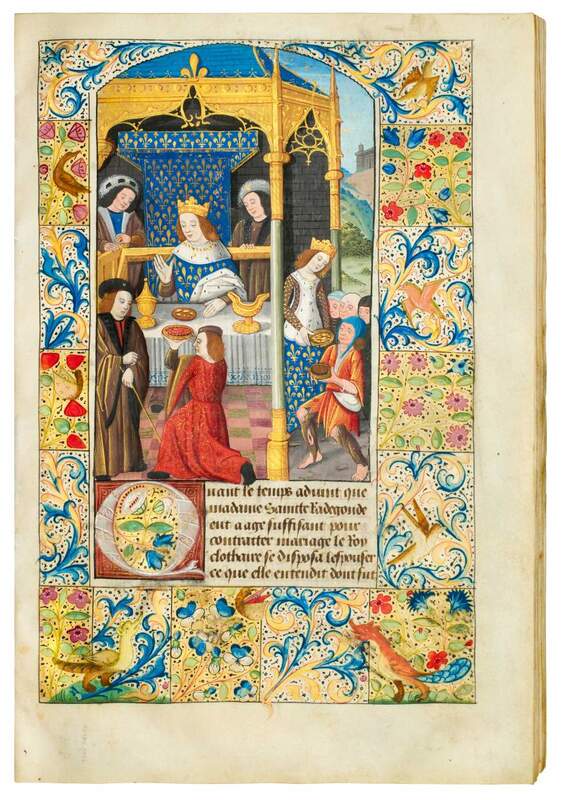 A unique gift from a Poitiers citizen: The richly illuminated manuscript on the "Life of St. Radegund", including her Office, Mass, and Miracles, accompanied by dedicatory poems, presented by the author to Charles VIII and Anne of Brittany, c. 1496-1498. 260 x 180 mm. – 66 leaves. With 11 large miniatures surrounded by full borders. St. Radegund (518-587) became queen of France (540) when she married the despotic Clothaire, King of the Franks. She then devoted herself to serving the poor and infirm. Years later, she escaped her cruel husband and founded a convent outside Poitiers, where she became known for her miraculous powers. Her authority as advisor and mediator made the convent increasingly more powerful. She grew to be the patron saint of women and of Poitiers, place of origin of the author and of this fine manuscript. History made Queen Radegund a symbol of what is righteous, good, and beautiful. Buried in Poitiers, in the church named after her, that city has honoured the former queen throughout the centuries. Texts have constructed an image of her queen-ship and good works, for which she became a role model. Her illuminated biography not only shows her as a humble and penitent woman, but also as a persuasive and intelligent personality. She collaborated with kings and bishops and the hagiographical-historical stories of her life give glory to her immediate context. Her religious community of women soon rivalled the power of the bishop by virtue of its social functions and prized relics - some, among others, presented by the Byzantine emperor. Her fame integrated Poitiers into a network of international exchange. At the end of the 15th century, the Poitevin citizen Jean Bouchet realized that she had been and still was an asset to the city. By promoting her memory, the whole community could benefit. He considered this duty to be so important that he repeated the tribute some twenty years later by offering a new and now printed text to Queen Anne's daughter, Queen Claude of France (1517). Heraldry and emblems within this manuscript show that it was made for the King of France, Charles VIII (1470-1498) and later adjusted to Anne of Brittany (1477-1514), both of whom are represented together (f. 60v). Bouchet had his royal gift illustrated with eleven charming miniatures and also added personal, dedicatory poems, in which he lauds Poitiers as "cité royale" and expresses the wish that Queen Anne may give birth to a "beau dauphin". The fascinating miniatures that tell Radegund's story are attributed to the Poitevin illuminator, named after this, his most important work, the Master of St. Radegund. He shows himself as an excellent storyteller with original compositions. This codex is a newly discovered royal, historical monument of prime importance not only to Poitiers but to all of France as well. See also the Epistres d'Ovide, which also pictures Anne of Brittany.